Valet testimonials - AutoCar Magazine, Lease Retunr Inspections. 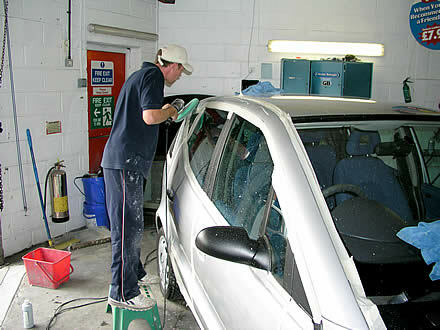 "Whether your own a car or lease one, preserving the it looked is becoming an important priority. In a used car market where good mechanical condition and a full service history is now taken for granted, the cosmetic condition of a car is, after it's mileage, often the biggest single variable factor determining what it's worth." "It's a painstaking process that can take can take up to 12 hours per car and cost up to £900 if the car is severely scratched. It may sound expensive, but it's a lot cheaper than a respray and, if you you're looking to impress potential buyers of your second-hand motor, that would be money well spent." "Absolutely excellent service, helpful, polite staff. My new leather seats look like new, my roof looks good as when it was first produced by BMW. The car was ready on time - ! am 100% satisfied and would recommend Clean Image. I will bring my car back for a valet - Thanks once again." "My vehicle was a lease return and the company sent me our "fair wear and tear policy" - one of the rare times we ask you to conform. I visited the web page "LEASE RETURNS", very useful. The team where very helpful and walked through the check sheet for the full inspection. After booking for smart repair, dents and chip I was very pleased to hear the lease collection folks, at first sight of the car, how they wished every car looked as clean and tidy when they collected. Many thanks Gary, excellent job, will pass on your details and will be back. "Thank you for your help. If I had known you had a website I would have looked first. " "The car was covered in scratches from a scouring pad, it looked awful. But after a lot of hard work and dedication from Mark it now looks amazing. He removed all the scratches and the paintwork looks as good as new. I am delighted with the result and very impressed with the service and the company. Even though we were quite far away, Clean Image would be my first choice!! I have told all my friends and colleagues. Just 25 minutes from Rayleigh! "I was impressed with the level of repair I received from yourselves. Like your literature says, the damage was inspected and I was advised as to what could be achieved; no hard sell or unnecessary work. I had one smart repair, a nasty scratch polished out and a small dent removed. To say the results put a smile on my face is an understatement, I am delighted; so much so I have begun to 'sell' your services at my place of work and four fellow colleagues are looking to contact you shortly with various problems they have with their cars. Mark who carried out the work talked to me on a level I understood, he was friendly, polite and above all didn't confuse me with jargon. Even a small scratch on the rear bumper that I said I could live with was touched in for me at no extra cost. I had previously received an estimate of £662.80p for the three repairs that Clean Image achieved for just £183. Now that's value for money! Thanks again Clean Image - I know where to come in future. " "The car looks great, thanks for a job well done. Definitely recommended. My second visit & the service has been great on both occasions". "Excellent, very informative and gave us lots of advice and assistance. Would definitely recommend you to friends. "I was very impressed from my first contact with Clean Image. They were very helpful with plenty advice on the phone. They phoned the day to confirm the appointment and explained fully everything they were going to do on arrival. It was obviously they had a genuine interest and passion for cars and wanted to do an excellent job for their customers. Well worth the journey for such good service." "Mark was attentive, thorough and helpful in his assessment of my vehicle. My car was valeted, wheel repairs + leather care of very well. It was what I expected, the car was as good, if not better than when I collected it from the dealership. Fantastic job, I will be going back for more."